This bed is small, but folks were actually smaller back then. The decorative arches are located at either end of the bed on the apron, above the carved Gothic arches to support the top rails. The front apron has decoration that mirrors the decoration of the ends, but scaled down. This is a FANTASTIC looking and rare antique period Queen Anne panel back settle. Overall this is a spectacular piece. For your consideration is this delightful early 18th century, around 1720s, what I believe to be Portuguese embroidered foot stool. The first thing you notice is what a wonderful size this is. And the intricate carving on the talents. It is constructed of richly toned oak with pinned mortise and tenon joints and worn plain lower stretcher rails. The top strechers are a hand carved frieze. It has a top with shallow molded edge and stable old crack. Nice example of a Georgian period, English country “bacon settle” of typical form having cupboard with 2 paneled doors behind the seat, which open to reveal storage with hand- wrought iron hooks and later coat hooks; base with 2 drawers flanked by 2 doors. Rare all original late 16th or early 17th century Italian walnut stool. The sides showing signature Baroque profiles joined by a turned stretcher. The thick hexagonal top with molded edge and centre cut opening for easy lifting. Done in silk upholstery with embroidery. This is in excellent condition for its age, sturdy and comfortable, The pillows are down filled. There is a small cap in one backboard 1/4" and a crack in one back board, very stable. Size 58 x 11 x 35". seat height 20". in excellent condition. Spectacular 18th C painted French bench with storage. Perfect in any space. Sweet Colonial period country Chippendale foot stool. Hand planed pine boards. Mortised construction. Square nails used for decorative molding. Splayed sides and scrolled design typical of this style. Attractive primitive style. Vermont estate. Queen Anne. ~ Possibly late 18th century, or early 19th century. AGE / ORIGIN 200 years, England. 3-6 weeks. NOT included in the price. This will ensure all-around efficiency, as we prefer to have the piece(s) located, prepped, & ready prior to your scheduled arrival. Gorgeous Antique Irish Pine Settle or Bench circa 18th Century. It is Very Good Condition with wear consistent with its age. This settle has a storage area under the bench accessible through a small door cut into the middle of the piece. This is a rare and a functional decorator piece! A Fully Developed Mahogany Chippendale Commode Stool, c.1760. This is a beautifully sculptured Chippendale chair, and obviously, "the master's commode". It retains its original surface and is one of the finest of its type. Cave of Treasure. so we can together resolve the situation. P urchases must be completed. You get it in the original condition. I do not wash it or not I clean these. It’s constructed of the desirable walnut and has a deeply carved crest which is a work of art unto itself. Width: 21 in. Length: 60 in. Providence RI. This is an antique foot stool in walnut with a needlepoint tapestry cloth. An English provincial stool dating to the Regency period of the early 19th century, circa 1820. Attractive florally patterned needlepoint tapestry cloth. For nearly 30 years, with galleries in New York and Dublin, O'Sullivan Antiques has specialized in the finest Georgian and Regency furniture from Ireland and England. We look forward to hearing from you. This is a great country piece and would make a lovely coffee/centre table; stool or just to have on display as it is. CINOA is the world association of Art & Antique dealer associations (representing 5000 dealers from 32 associations in 22 countries). About the item: Fine quality antique 18th century Oak settle/bench with void interior under hinged lid, c 1720. This is a quality piece ,I think from the carving it is Flemish. I value your custom and will do all I can to keep you happy and satisfied. This is a 3 legged stool of the milking type and was traditionally made with 3 legs to cope with the uneven floor surfaces that existed 2/300 years ago. Roughly carved legs and joined to the top with inserted wedges that tightened as the legs were tapped in. This is an antique tavern bench, a Georgian, English oak, six seater form dating to the early 19th century, circa 1810. Attractive grain interest in the stout planked top. Max Depth: 24cm (9.5"). Three legs and frieze bars providing added strength. This is an antique tavern bench, an English, late Georgian, painted pine settle dating to circa 1800. A unique piece ideal for the hall or kitchen. Bow seat panel, back with offset wings. We will get the best possible service and cost for you. Early English elm milking stool. Circular top. Across top at widest 10". HERE WE HAVE A TRADITIONAL SWEDISH BENCH IN AS FOUND CONDITION CIRCA 1830. SEAT IS REMOVABLE TO ALLOW THE BASE TO PULL OUT AND FUNCTION AS A BED. ORIGINAL RED PAINT WITH HAND PAINTED BLACK PATTERN. Early English oak stool. Stands just 8 1/4" tall. Note the wear on the top of these rails from 200 years of use. with saber legs and scroll supported rails decorated with reeds and roundels. Regency Mahogany Foot Stool Circa 1815. If you would like to see more of the our restoration work we are currently putting together a youtube channel here. Are you looking for a light baby carrier for travel?Bethbear Baby Waist Stool Seat Carrier can be your first choice! - Multiple Positions: allow you to carry your infant or toddler in any position: face in, face out, stand or lay down. Up for sale is this wonderful old primitive pine settle. It's old and probably from the 1700's or 1800's. It's old and we're not sure how old, you decide. The sides are nicely shaped. We're not sure of the type of wood but it looks like either pine or hickory. Distressed finish to mimic an antique. Dovetailed construction. I have collected antiques my entire life and this piece fits in nicely with my other antiques. 85" wide, 70" high, 18" deep. Top piece is removable. In good working condition with typical age and use wear. This large curved back settle is a rare find. This is the second of 2 Antique Elm Temple Benches that were brought back from China several years ago. Made from driftwood found along the shore of the Korean Sea, this bench graced a temple swallowed by the 3 Gorges Dam. This is a great 18th century hall bench. Nice carvings on both ends. Back has been upholstered. SALE! Antique Settlers Bench Primitive Settle Pew 1700's HUGE RARE! 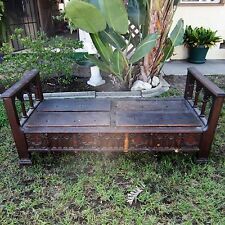 Very rare primitive antique handcrafted settlers "Settle" bench that dates from the late 1700's to the very early 1800's. Notice this is curved! That is one solid piece of wood for the seat! These were placed in front of the roaring fire where the settlers would "settle" on the bench. This is one of 2 Antique Elm Temple Benches that were brought back from China several years ago. Made from driftwood found along the shore of the Korean Sea, this bench graced a temple swallowed by the 3 Gorges Dam. Bring a majestic air to your school or garden with this solid oak two seater story bench. Magnificent 18th Century Spanish Colonial Escaño - Bench. Dark wood, heavy piece. In very good condition for the age of the piece. Rare 18th Century Jacobean Church Stool Bench - Solido oak ! Jacobean Church Stool. Rare Antique 18th Century. Its easy and safe.